Squamous cell carcinomas (SCC) arise from the skin of the external auditory canal and are relatively rare entities . Primary carcinoma of the pinna and external canal is rare and the prognosis is ominous except for those cases diagnosed incidentally following external otitis. They may be related to chronic infection, radiation exposure, and sun or cold exposure. Both squamous cell carcinomas of the external auditory canal and malignant otitis externa can present with a painful, discharging ear with granulation tissue involving the external canal refractory to initial antimicrobial therapy . However, the challenging anatomical location and invasive nature makes this type of cancer extremely difficult to treat, particularly in more advanced stages . There is no established consensus on treatment because of the limited number of cases of squamous cell carcinoma pinna and external canal. The most frequently reported treatment involves surgical resection with or without adjuvant radiotherapy. Chemotherapy, brachytherapy or alternative treatment methods such as superselective intra-arterial chemotherapy injection have been described in the literature, however, their exact role remains to be determined [4,5]. We present here a patient with squamous cell carcinoma of the pinna and external auditory canal, and discuss the challenges associated with the diagnosis and treatment of the disease, and review the literature for trends while outlining the most beneficial treatment strategy for this patient population. A 42-year-old Chinese man presented with a eight- years history of right sided otalgia and discharge. The patient have not a history of ultraviolet light exposure, thermal injury (cold), radiation exposure. He has the chronic infection of the external auditory canal. At the beginning, the treatment included ear toilet with dry suction, pain control, and topical antibiotics. The neoplasm initially was the size of peanut, and gradually increased about 4 cm × 5 cm. And the patient was with the sense of hearing loss, ear fullness which resembled, otalgia, itching. He was admitted to our hospital. On examination, the patient's symptoms were associated with right auricle having irregular cauliflower-like uneven neoplasm with stench and yellowish-white discharge, and the ulcer was easy bleeding, which size was 5 cm × 6 cm, and the sign with right supraclavicular fossa palpation of swollen and movable lymph nodes which size was about 1 cm × 1 cm (Figure 1). 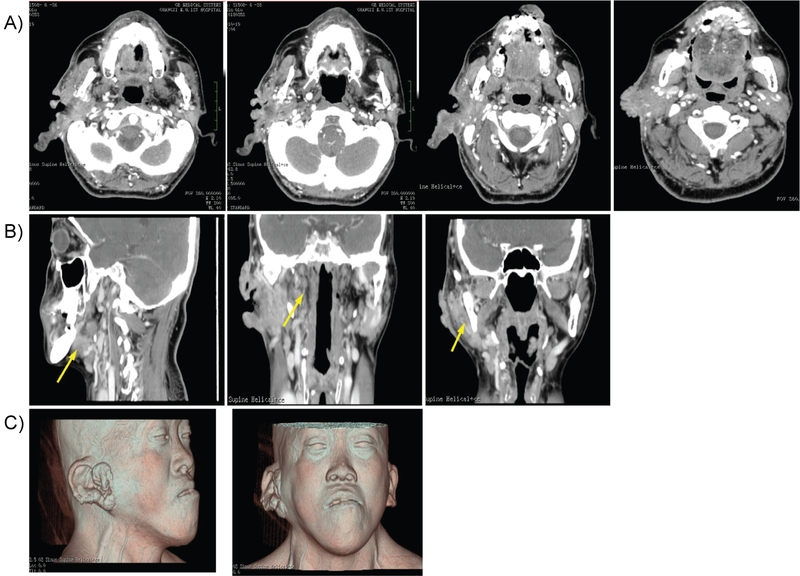 Computed tomography revealed a tumor mass filling his right pinna and external auditory canal and infiltrating the right parotid, temporomandibular joint, external auditory canal and middle ear, and the metastasis of the right neck lymph node (Figure 2). No abnormality was found on clinical examination, including neurotological examination, the chest roentgenogram, nasoendoscopy and laryngoscopy. On histopathological examination demonstrated an inflamed stratified squamous epithelium with dysplasia and cellular atypia. Within this, there were embedded irregular nests of atypical squamous cells infiltrating the underlying stroma (Figure 3). Based on the Pittsburgh staging system, the diagnosis of a stage VI squamous cell carcinoma was made . Considering the advanced stage, the patient was deemed not to be a surgical candidate. He don't received a course of specific palliative radio -therapy for advanced head and neck cancer, with concurrent carboplatin radiosensitization because of the economic reason. Squamous cell carcinoma (SCC) of the external auditory canal is an rare malignant carcinoma  that arises from the external ear and spreads to the temporal bone and surrounding sites. Periauricular soft tissues, the parotid gland, temporomandibular joint and mastoid are common sites of tumour progression. The carotid canal, jugular foramen, dura, middle and posterior cranial fossae are invaded in advanced stages. Ear pain and discharge may initially be mistaken for external otitis . Involvement of the ear and lateral skull base by squamous cell carcinoma is usually the result of a cutaneous neoplasm that originates from the skin of the pinna or the external auditory canal. Ultraviolet light exposure or thermal injury (cold) and radiation exposure and chronic infection are thought to predispose patients to this disease [2,9]. The lack of a unifying classification system in the past, along with the rarity of the disease has made the development of clear treatment guidelines difficult. Aggressive surgery with postoperative radiation is the usual treatment [10,11]. The complex anatomy and changing relationships between the tumour and contiguous tissues within a limited space make it complicated for surgery to achieve tumour-free margins. There has been a slow evolution of the treatment of squamous cell carcinoma in pinna and external auditory canal . Treatment of squamous carcinomas of the external canal should be aggressive because of the high rate of recurrence. Treatment with en-block resection, selective neck dissection, and radiotherapy is recommended in cases if the patient would like, as recurrence rates and nodal metastasis are relatively high. However, the prevention was important. Appropriate clothing, sunscreen with at least SPF 30, and avoidance of intense sun exposure may prevent skin cancer . This case and the other cases [14-16] reported in the literature highlight the importance of surgery and biopsy in the investigation and diagnosis of squamous cell carcinoma in pinna and external auditory canal when the cause is a chronic infection of the external auditory canal (malignant or necrotizing otitis externa) refractory to standard treatment regimes. Successful diagnosis and management of both these pathologies involve a multidisciplinary team approach and a meticulous unification of a detailed clinical examination, laboratory investigations, appropriate radiology, and biopsy to create a complete clinical picture. Hence, in this report, we describe a case of a rare and aggressive tumor type for which the most beneficial therapeutic approach remains to be determined. It is clear however, that, if diagnosed late, this disease exhibits poor outcomes, while it is associated with higher response rates and increased survival at early stages. Thus, emphasis should be placed on the importance of early detection, diagnosis and treatment of squamous cell carcinoma of the temporal bone and middle ear as the simplest and most effective measure to increase patient survival. Squamous cell carcinoma in pinna and external canal is a rare disease of skin malignant tumor. It is likely to be under-reported. Emphasis should be placed on the importance of early detection, diagnosis and treatment of squamous cell carcinoma of the in pinna and external auditory canal as the simplest and most effective measure to increase patient survival. Oya R, Takenaka Y, Takemura K, Ashida N, Shimizu K, et al. (2017) Surgery with or without postoperative radiation therapy for early-stage external auditory canal squamous cell carcinoma: A meta-analysis. Otol Neurotol 38: 1333-1338. Moody SA, Hirsch BE, Myers EN (2000) Squamous cell carcinoma of the external auditory canal: An evaluation of a staging system. Am J Otol 21: 582-588. Kuhel WI, Hume CR, Selesnick SH (1996) Cancer of the external auditory canal and temporal bone. Otolaryngol Clin North Am 29: 827-852. Ueda Y, Kurita T, Matsuda Y, Ito S, Nakashima T (2009) Superselective, intra-arterial, rapid infusion chemotherapy for external auditory canal carcinoma. J Laryngol Otol Suppl 75-80. Budrukkar A, Bahl G, Bhalavat R, Laskar SG, Agarwal JP, et al. (2009) High-dose-rate brachytherapy boost for carcinoma of external auditory canal. Brachytherapy 8: 392-395. Arriaga M, Curtin H, Takahashi H, Hirsch BE, Kamerer DB (1990) Staging proposal for external auditory meatus carcinoma based on preoperative clinical examination and computed tomography findings. Ann Otol Rhinol Laryngol 99: 714-721. Pensak ML, Gleich LL, Gluckman JL, Shumrick KA (1996) Temporal bone carcinoma: Contemporary perspectives in the skull base surgical era. Laryngoscope 106: 1234-1237. Grandis JR, Hirsch BE, Yu VL (1993) Simultaneous presentation of malignant external otitis and temporal bone cancer. Arch Otolaryngol Head Neck Surg 119: 687-689. Furrukh M, Mufti T, Hamid RS, Qureshi A (2014) Squamous cell carcinoma of external auditory canal lacking epidermal growth factor receptor protein overexpression, in an elderly Omani with oculocutaneous albinism treated with palliative radiotherapy. BMJ Case Rep.
Masterson L, Rouhani M, Donnelly NP, Tysome JR, Patel P, et al. (2014) Squamous cell carcinoma of the temporal bone: Clinical outcomes from radical surgery and postoperative radiotherapy. Otol Neurotol 35: 501-508. 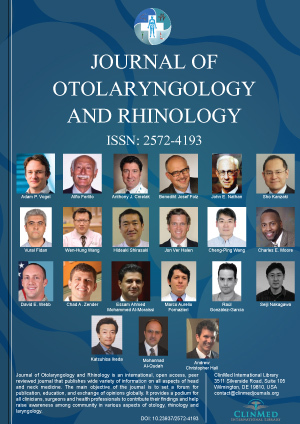 Mazzoni A, Danesi G, Zanoletti E (2014) Primary squamous cell carcinoma of the external auditory canal: Surgical treatment and long-term outcomes. Acta Otorhinolaryngol Ital 34: 129-137. Takenaka Y, Cho H, Nakahara S, Yamamoto Y, Yasui T, et al. (2015) Chemoradiation therapy for squamous cell carcinoma of the external auditory canal: A meta-analysis. Head Neck 37: 1073-1080. Gallagher RP, Lee TK, Bajdik CD, Borugian M (2010) Ultraviolet radiation. Chronic Dis Can 29: 51-68. Iljin A, Antoszewski B, Durko M, Zieliński T, Pietruszewska W (2018) External auditory meatus and/or conchal bowl reconstruction with postauricular island flap in patients with basal cell carcinoma or squamous cell carcinoma. Otolaryngol Pol 72: 4-10. Ganeval-Stoll A, Bruant-Rodier C, Dissaux C, Lutz JC, Wilk A, et al. (2014) Squamous cell carcinomas of the ear: Factors of gravity and surgical treatment, about 30 cases. Ann Chir Plast Esthet 59: 226-231. Allanson BM, Low TH, Clark JR, Gupta R (2018) Squamous cell carcinoma of the external auditory canal and temporal bone: An update. Head Neck Pathol 12: 407-418.